Want to work in an innovative field? You better enjoy teaching. 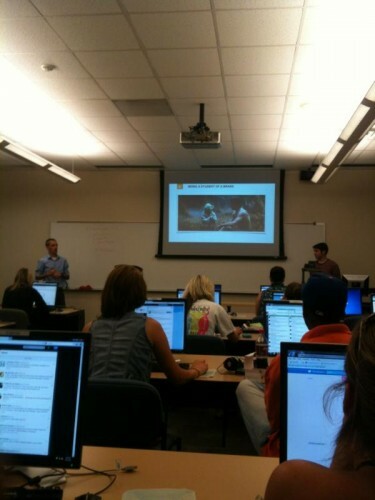 Every once in a while, @ChadATL and I have the opportunity to go around and speak at different college classes. It's probably one of my favorite things to do as part of my job. Getting a fresh perspective on what rising young professionals think about my line of work and trying to help them avoid some of the same mistakes I have so far is a lot of fun for me. I know when I was a student, I loved hearing from people "in the real world." This past Monday, we had the opportunity to speak to a social marketing class at Kennesaw State about personal branding and how to get a job out of school. As part of all of our talks, Chad and I always encourage students to keep their computers on and their phones handy. We encourage all of the students to tweet and chat about our discussions using the #EnguageU hashtag and try to reply to questions online after we leave the building for any follow up help that extends beyond our Q&A session post-talk. During our Q&A time, one student in the back raised his hand to ask how we would deal with a difficult organization he was interning for. He had frustrations with having to "spin his wheels" showing his higher ups how to use very basic Facebook functionality. He felt like his skills were way more advanced to waste his time having to teach rudimentary skills like Facebook status updates and such. He asked us how we would deal with that situation, since we work full time in social media. In a kind way, we essentially told him to get over it. One of the things about working in social media or any innovative space is that you're going to learn about things quicker than the average person on the street. That's part of being "innovative," you get to learn about things before most people. When it comes to social media, ad and marketing geeks aren't like the rest of the world. At all. There's even an infographic here to prove it. My assumption is that this student thought that being part of a social agency, we didn't have to deal with internet "civilians." We were always able to work with high-tech clients and not have to worry about the basics. He didn't realize how wrong he was. Sure, we get many opportunities (more than most) to stretch our thinking and work on some really cool concepts. However, much of our work is educating our clients - and even coworkers - about what's new in social, best practices and even some basic 101 types of knowledge. And that's okay. Teaching is one of the aspects of my job I like best. Teaching is also when I probably learn the most.